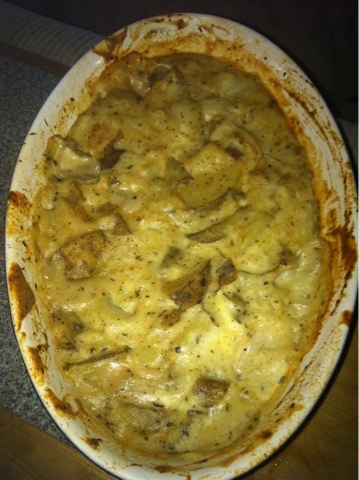 Hmmmn, I guess I put this one off because it was my lazy girl attempt at Scalloped Potatoes. I am always trying to think of ways to limit the amount of cream I put into these potatoes, but I can’t help but love that creamy taste. 4-5 Potatoes, sliced into thin ovals. Slice your potatoes, I like to fry these in a pan or or grill these on a non-stick grill with tiny amount of butter until golden on the outside, not completely cooked. Remove and put in a baking dish or pan. Add spices and mix them up, so it spreads evenly on potatoes. In a separate container, melt and mix the milk, cream cheese and butter. I usually pop this in the microwave then mix. I always make sure that it covers all of the potatoes, so depending on your pan size and amount of potatoes, adjust sauce by making more. Soak those babies. Then you can either bake your potatoes for about 20 minutes or pop them into the microwave for about 30 on high. Either way, cook until your potatoes look so yummy and fall apart.